The elegant but weighty Sub Zero Multisport Award features a circular motif for your logo insert. The trophy is sculpted into an iceberg shape from superior quality glass. This great value award is made from a quality 20mm thick glass and formed into an irregular shape to resemble a piece of ice. The flat flawless face is left clear to be engraved with a personal logo and inscription of your choice and would make a stylish award for a number of occasions. 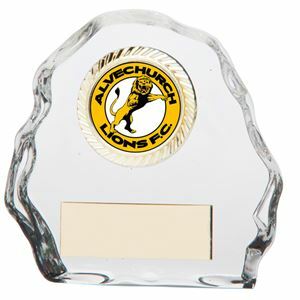 The Sub Zero Crystal Award can be purchased with or without personalised high quality engraving. 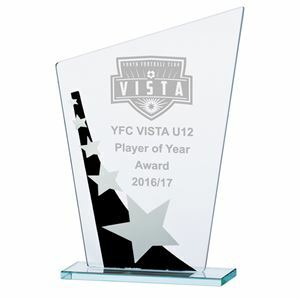 The engraving on your crystal award may also be single colour infilled with silver or gold colouring for a premium, high contrast finish. Simply select this option below and select the fill colour from the drop down list. The Quantum Jade Glass Multisport Award is made from premium quality 5mm thick jade toned clear glass and finished with blue tinted wave clipped edges. The circular crystal plaque showcases a star embossed circular metal insignia. This elegant award offers you excellent value for money. This elegant award is formed from a high grade 5mm thick glass, the simple design showing off the clear polished glass to its best effect. The rectangular Warrior Jade Glass Award stands on a small base plate and can be fully engraved with a personal text message and logo. 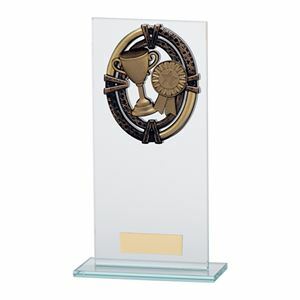 The Warrior Jade Glass Award can be purchased with or without personalised high quality engraving. 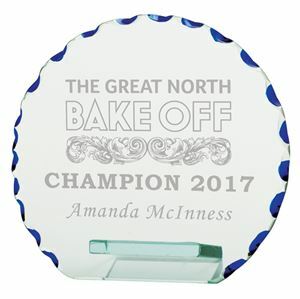 Precision cut into a round plaque, the Quantum Jade Glass Award features a glossy flat face ready for engraving and is finished with an attractive nibbled edge, painted blue to create a pleasing wave effect. The award is supported by a discreet glass prop to the rear leaving the front clear for personalised engraving of your choice. The Quantum Jade Glass Award can be purchased with or without personalised high quality engraving. Decorated with a black curve and a series of silver stars of decreasing size, the Mega Star Jade Glass Award Black and Silver is made from a clear jade toned glass. Standing on a slim glass plinth, the asymmetric award features a large polished area which can be engraved with a text message and logo. The Mega Star Jade Glass Award Black and Silver can be purchased with or without personalised high quality engraving. This modern award is formed from a premium jade toned glass. Precision cut into a diamond shape, the award is mounted on a flat slim glass base. The Jade Galactic Glass Award features curved striped sides of blue and silver, leaving a central panel clear for a personalised engraved message. 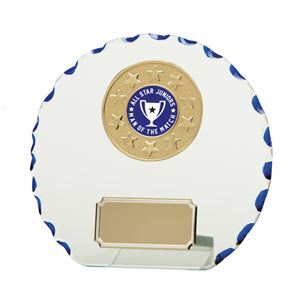 The Jade Galactic Glass Award Blue and Silver can be purchased with or without personalised high quality engraving. 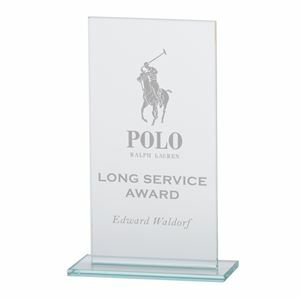 This stylish crystal award is made from a quality 5mm thick jade glass and is finished with bevelled edging. Standing on a small glass base the trophy features a decorative bronze plaque illustrating a trophy and a rosette and would make an ideal award for any sporting success. This crystal plaque features a sharp coloured image of a pigeon on a blue background. This quality print curved image is made from a glossy acrylic and is self adhesive. The Colour Curve Pigeon Racing Glass Trophy is made of premium 5mm thick clear jade toned glass and has bevelled edges. This striking octagonal award is formed from a high grade 5mm thick jade toned glass and mounted on a slim glass base plate. 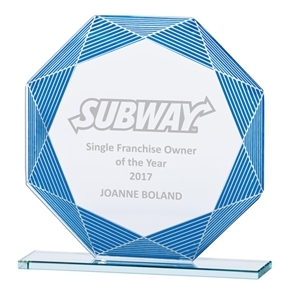 The Jade Vortex Glass Award is decorated with a series of blue and silver striped inter-locked triangles forming a border leaving a central flat area which can be personalised with an engraved text message or logo. The Jade Vortex Glass Award Blue and Silver can be purchased with or without personalised high quality engraving. 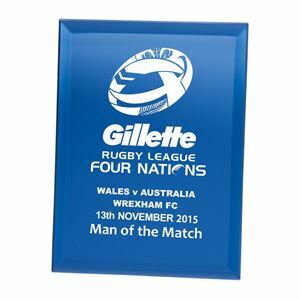 This quality rectangular award is made from a quality 5mm thick blue mirrored glass. The highly reflective award features bevelled edges and stands upright supported by a photo frame style up-stand. The glossy surface of the Azzuri Blue Mirage Mirrored Glass Plaque is fully engravable and can be personalised with text and a logo. The Azzuri Blue Mirage Mirrored Glass Plaque can be purchased with or without personalised high quality engraving.